We already have beautiful 3D maps, but the public lacks useful 3D maps. The photorealism of Google Earth and Apple Maps doesn't help us navigate indoors, explore building schematics for repairs and studies, etc. Floorplans will prove to be highly useful in helping people navigate the complex corridors of skyscrapers and other dense urban areas. It'd be rad to use these highly detailed 3D schematics to give people x-ray vision through buildings with handheld devices or headsets. I made a mockup of what this could look like while I was at a coffee shop in Deep Ellum, Dallas. Just illustrates how dope it'd be. An additional benefit to the wireframe 3D imagery, is that if it only draws the borders of the buildings, it'll require significantly less data than the current photorealistic buildings. However, complex internal 3D wireframes might bring resource usage back to parity. so whatever, I guess. 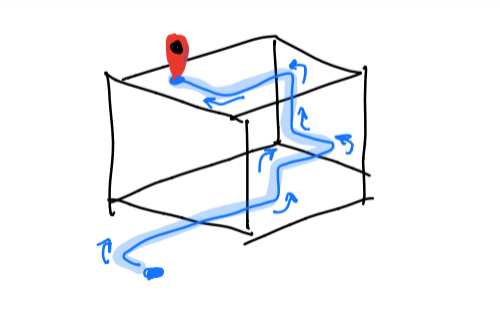 OpenStreetMap has many projects relating to indoor mapping, but the proposal which most closely resembles my idea outlined above is an inactive proposal. Let’s bring it back to life!